PT Astra International Tbk - Honda Sales Operation (HSO) or referred to as "Astra Motor" is a reputable automotive company in Indonesia. 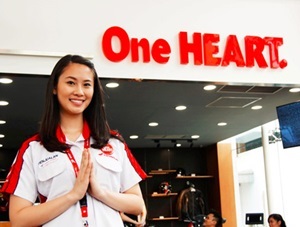 Astra Motor has core business competencies in distribution and retail sales of Honda's two-wheeled vehicles manufactured by PT Astra Honda Motor (AHM). Astra Motor operates primarily as a main dealer of Honda Motorcycles responsible for sales of Honda motorcycles and spare parts and after sales services in Indonesia. Astra Motor is a corporate operation of PT Astra International Tbk (Astra Group), the large business conglomerates in Indonesia. According to information found in the Company's website, Astra Motor now has 160 Dealers, 80 Authorized workshops with number of sales outlets of more than 100 outlets and more than 3,550 employees with monthly sales of 30,000 units. D3/S1 all majors with GPA min. 3.00 from reputable university. Have a interest in business and marketing. JobsCDC.com now available on android device. Download now on Google Play here. Please be aware of recruitment fraud. The entire stage of this selection process is free of charge. Astra Honda Sales Operation - D3, S1 Fresh Graduate BM Development Program Astra Motor January 2018 will never ask for fees or upfront payments for any purposes during the recruitment process such as transportation and accommodation.